1. 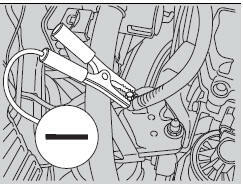 Connect the first jumper cable to your vehicle’s battery + terminal. 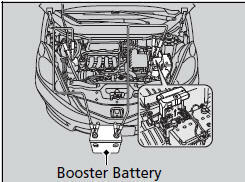 ► Remove the cover from the under-hood fuse box. 2. Connect the other end of the first jumper cable to the assisting vehicle’s + terminal. 3. Connect the second jumper cable to the assisting vehicle’s - terminal. 4. Connect the other end of the second jumper cable to the grounding strap as shown. 5. If your vehicle is connected to another vehicle, start the assisting vehicle’s engine and increase its rpm slightly. 6. Attempt to start your vehicle’s engine. If it turns over slowly, check that the jumper cables have good metal-to-metal contact.